A verse by verse study of Ephesians 4:11-32, where Paul writes about the need for growth and maturity of all Christians, forever putting away their former conduct. Paul sees that the members of Christ’s body can grow to spiritual maturity with the help of the teaching ministries that God has provided. ¶“11And truly God gave the apostles, and to those he added the prophets. He also gave those who preach the good message. Furthermore he gave the shepherds and teachers.12He did this to perfect the holy people to work as servants. This leads to the body of Christ being built up 13until we all arrive at the one faith and the knowledge of the Son of God. So the body of Christ becomes a mature man, measuring up to the full stature of Christ” (Ephesians 4:11-13). Paul earlier quoted the statement, "He gave gifts to men" (Ephesians 4:5). Now he mentions particular gifts that Christ gave, namely apostles, prophets, preachers, shepherds. The purpose of these teachers is to build up, strengthen, inform, and unify the body of Christ. 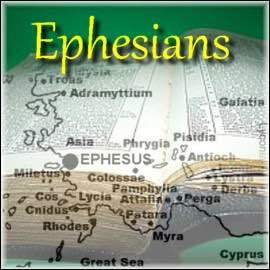 The apostles and prophets were inspired in a miraculous way and laid the foundation (Ephesians 2:20). Preachers and shepherds can work without miraculous gifts and their work is to build upon the foundation. Paul sees the growth and unity of the body threatened by false teachers who work in opposition to the God-given teachers. He points out that the body can grow only on the truth that comes from Christ its head. ¶“14May we be no longer children, tossed by waves, and blown around by every wind from the false teachers. These men are shrewd and cunning. They look to schemes of error. 15May we instead, speak the truth in love. May we grow up in every way toward the Christ who is head. 16From him the whole body is framed together, united by every joint provided. Each part works in its measure to make the body grow, building itself up in love.” (Ephesians 4:14-16). Dishonesty and deception is the essence of false teachers. They twist the truth cleverly and create a storm of confusion. They are not honestly mistaken in their error. They are scheming destroyers of truth. The body of Christ can, however, withstand the onslaught. The truth that comes from Christ the head causes the body to be fitted together with each part strongly united to the other. In an earlier analogy, Paul pictured Christ’s called out people as stones in a growing house of God, a holy temple "built upon the foundation of the apostles and prophets, Jesus Christ himself being the chief corner stone, in whom the whole building, being fitted together, grows into a holy temple in the Lord" (Ephesians 2:19-22). Now he sees the same people as members of Christ’s body, growing and "fitted together" as in the temple analogy. And just as Christ is the foundation of the temple, so he is the head of the body (Ephesians 4:15-16). Having spoken of the ideal, Paul now teaches a principle by which that ideal can be achieved. There has to be fundamental change —a change so radical that it may be viewed as a change from death to life. ¶“17So I say this, and say it solemnly in the Lord, that you must no longer walk as the Gentiles do. They walk in the futility of their minds. 18They are darkened in their understanding. They are alienated from the life of God. That's because of the ignorance that is in them due to their hardness of heart. 19They have become callous and have given themselves up to sensuality. They crave to practice every kind of impurity” (Ephesians 4:17-19). This is Paul’s second description of the unsaved. The first was in chapter 2 (Ephesians 2:1-3,12). Paul writes frankly. People without Christ are living in darkness and dead in sins. They bear at least some responsibility for their condition, since they do not listen to God; they harden their hearts; they give themselves over to sin; they nurture their cravings. Manifestly, holy people don't live like that. Sinners must change their heart and be reborn to a new way of life. Having described the sinner’s death and darkness, he now describes the renewal. ¶“20But that is not the way you learned Christ 21—if indeed you did hear about him, and were taught in him as the truth is in Jesus. 22 You are to renounce your old self, which belongs to your former way of life. The old self is corrupt befitting its deceitful desires. 23You are to be renewed in the spirit of your minds. 24 You are to put on the new self. It has been created as befits God, in true righteousness and holiness.” (Ephesians 4:20-24). Not everyone learns Christ. To do that you have to really hear Christ, take in what he says, and follow it carefully. A lot of religion is shallow and doesn't make people become new people who have cast away the people they used to be. It doesn't change people radically, genuinely, to true righteousness and holiness. Paul now moves from theory to practice. He has been speaking of Christ’s holy ones as a body whose head is Christ. In this body every member has undergone a renewal from death to life, and now serves to keep the entire body growing in strength, maturity, and unity in the truth that comes from the head. But how does that translate into practical daily Christian life? ¶“25So renouncing falsehood, let each one of you speak the truth with his neighbor, for we are members one of another. 26Be angry and do not sin. Do not let the sun go down on your anger. 27Give no opportunity to the devil. 28Let the thief no longer steal, but instead toil. Do good work with your own hands so that you may have something to share with the needy” (Ephesians 4:25-28). The qualities of holiness are not mysterious. They are simple things like truth, peace and love. Philosophy can make such qualities seem complicated, but Christ simply has us put them into practice. Tell the truth, don't tell lies. Be angry for good reasons, but control bad temper. Stop stealing and do honest work, sharing your reward with the needy. Of course what you say can be as important as what you do. Or to put that another way, the most important thing you do may be to speak. So Paul addresses that too. ¶“29Let no unwholesome word escape your mouth. Instead, say only what is good to build up. Speak as needed to give grace to those who hear. 30Do not grieve the Holy Spirit of God, by whom you were sealed for the day of redemption. 31Let all bitterness and bad temper and anger and outbursts and slander be rejected from you, along with all malice. 32Be kind to one another, tenderhearted, forgiving one another, as God in Christ forgave you.” (Ephesians 4:29-32). Without the Holy Spirit there would be no renewal or Christian walk. At the rebirth we receive him, as Peter asserted on the day of Pentecost. He told those who believed the truth, "Repent and be baptized every one of you, in the name of Jesus Christ for the forgiveness of your sins, and you shall receive the gift of the Holy Spirit" (Acts 2:38-39). Christ lives in us through the Spirit, and so we live in Him and for him as vibrant members of his body. —Jesus is an author who finishes his work. His work is our faith enduring through many trials until finally glory comes and we live happily ever after. Every day Jesus is helping this story to be finished, and we should consider how he is doing this. Tap the title above, next to the arrow, to go to that lesson with a link back to this page. —In this age of short cuts and quick fixes, we sometimes forget the principle that roots have to be established downwards before fruit can be borne upward. Tap the title above, next to the arrow, to go to that lesson with a link back to this page.